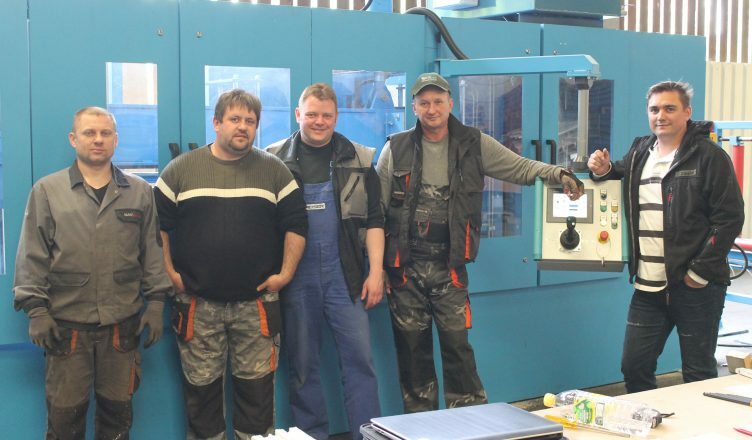 WST Tragwerke GmbH has installed a production machine for HTS beams up to 670 mm in thickness at its development center in St. Wendel-Bliesen. The machine is predominantly used for the manufacture of prototypes for the development and modification of production methods. WST Tragwerke GmbH has developed fittings and connections for HTS beams in Bliesen. Currently, HTS can be made on the machine with single HTS web or dual HTS web to a length of 25 m and a thickness of 670 mm. The machine is capable of producing beams with a camber up to l3/100. The HTS beam production machine with an operating team of 2 to 3 can output about 1,000 running meters in one shift. Further objectives of the WST development department in Bliesen are to increase the production speed and produce beams with smaller radii. To this end, besides prototypes, HTS steel web beams can also be modified. The HTS production unit is designed so that all major Nailweb webs can be processed. Prospective production partners or companies, who are interested in the production and distribution of HTS hybrid beams or WST products, may see the unit in trial operation by appointment. The two photos show from right to left Serge Schwenk, Sergei Felix, Eckehard Worch, Alexander Hermann and Igkor Papadopoulos during installation and the trial operation of the HTS beam machine. In the background of the second photo is an HTS beam with an HTS dual web, a thickness of 410 mm and a total length of 13.50 m. In the foreground Mr. Papadopoulos Igkor is lifting an HTS hybrid beam of 230 mm thickness and a length of 5.0 m without any problems alone (virtually suspended on a watch chain). Interested parties should contact Serge Schwenk, WST Tragwerke GmbH, Germany Gewerbepark Bliesen 1a, 66606 St. Wendel-Bliesen, Tel. +49 (0) 6854-909894-17, or Email: s.schwenk@wood-steel.eu.